Yesterday I ran a hard long run, the first time I have run eighteen miles since October. I went to Firle Beacon, then down Firle Bostal to Firle, over the A27 to Glynde, past the Glyndebourne alpacas and to the entrance to Glyndebourne Opera House. The return journey was hard, particularly the slog back up Firle Bostal. For the first time I took water and gels. I also need to record a nine miler on Thursday over Seaford Head and four miles (the Garmin ran out of juice) on Saturday. Today I ran eight miles on one of the Seaford Striders' training routes, out to Bo Peep, back down and up the Greenway (the reverse of the Seaford Half marathon route), then back beside the golf club in a High and Over direction. The weather was once more fine, almost hot, with a touch of mist. Tractors ploughed the hills and sheep were gravid with lambs to be born soon. In what may have been the last of the sunshine for a while, I ran fourteen 200m fast runs with 100m recoveries along Seaford front, with mile warm-up and cool-down. 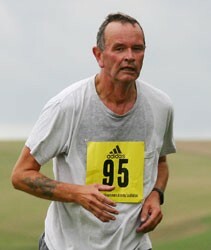 Today I ran this race for the fourth time, in brilliant sunshine. My time might have been better, if I had not had to stop for shoelaces twice and a wee once. I was poorly prepared: the shoelace problem would not have come up if I had paid attention when putting my shoes on, and I left too little time before the start for visits to the loo and so on. In the event I was not too disappointed with a time under two hours. I think I ran faster in the second half and was able to mark my progress by overtaking various conspicuous runners towards the end. Events like this remind me how much running is a collective thing. I saw lots of runners encouraging each other. Everyone was good humoured, even on an eccentric route. I may not do this again though. It was crowded, which is a good preparation for London, but it is very much for tourists. I may try Eastbourne next year. Yesterday I ran three brisk miles, with a mile warm-up and cool-down, along Seaford front. The brisk three miles were run at a pace of 10.25, not actually that brisk. One more beautiful day, more like May than February, and I ran to Bo Peep and back. On a beautiful sunny afternoon, by a mirror-like sea, I ran three fast miles, with 400m recoveries and mile warm-up and cool-downs. The fast miles were not that fast, but I did lose some fitness during my lay-off. Yesterday being a rest-day, I enjoyed a 1 km swim. I hope to do more. Recovering from my cold, I didn't run much this week, but I ran 15 miles today, to compensate for the lack of a 14 mile race last weekend, and to go some way towards the programme's target of 16 miles. The weather was gorgeous, violets were out and I ran out to Firle Beacon, on to the Beddingham aerials, then back past America Farm, down to Bishopstone, out to Tidemills and back the length of Seaford front. I also did an unrecorded Stanmer Woods run on Thursday with Jana, about 4 miles, my last run as an employee of the University of Sussex, though I hope to be back to use their showers in the future. I ran at lunchtime, along the latter half of the cow run route, the surface muddied and difficult as a result of tractors churning up the paths. I felt fine, though I do not think I could have managed the prescribed hills; no matter, I can fit more hills into the programme later on. My statistics for this week are not impressive. After Wednesday the weather on Thursday was so awful I postponed that day's run, Then I was laid low on Friday by a stinking cold and have not run since. I hope this will not matter.